Liverpool’s No.7 continued his excellent early season form with another outstanding display in Tuesday’s 3-2 victory against PSG at Anfield. The Reds kicked off their 2018/19 Champions League campaign in style with an enthralling encounter against the French champions, with Roberto Firmino’s stoppage-time winner securing the three points shortly after Kylian Mbappe looked to have stolen a draw for the visitors. While last season it was Liverpool’s front line which regularly took all the plaudits, Jurgen Klopp’s attackers haven’t quite fully clicked into gear just yet this time round. Yet the team as a whole has put together six consecutive victories to open the new season, and against PSG it was the midfield trio who proved integral, with all three putting in exceptional individual performances while working together as part of a cohesive unit which was able to dominate for the majority of the contest. 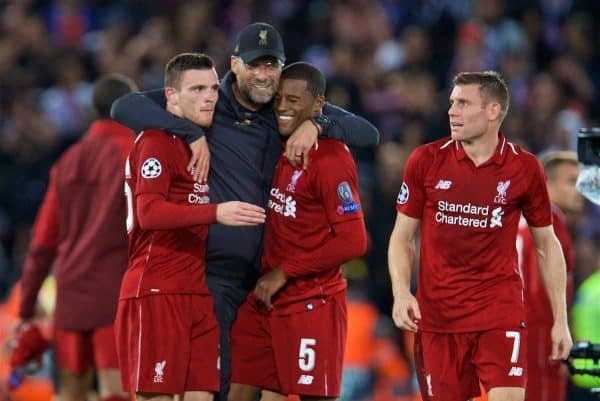 With new summer recruits Fabinho and Naby Keita watching from the substitutes bench, Jurgen Klopp went with the trio who started last season’s final in Kyiv; Jordan Henderson, Gini Wijnaldum and James Milner, who each fully justified the manager’s decision. It was Milner’s tackle on Mbappe deep inside PSG’s own half which led to the chance for Firmino’s last gasp winner, and this was just the latest piece of evidence that Milner is hitting his peak as he enters the twilight of his career. With the arrivals of Fabinho and Keita, many would have expected Milner’s game time to be significantly reduced this season, featuring much more as a utility squad player rather than a regular starter. Yet the Yorkshireman has started all six games so far this season and has been one of the standout performers in Liverpool’s 100 per cent start. 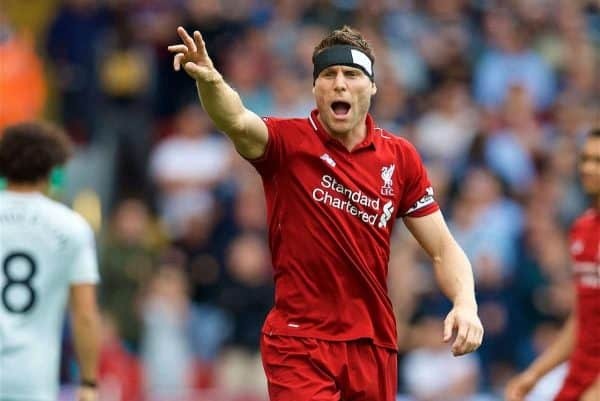 He will turn 33 in January, but since the start of the calendar year, Milner has stepped his game up another level, proving a pivotal influence in Liverpool’s run to the Champions League final last season, breaking the record for the most assists in a single season in Europe’s elite competition. It is a testament to his professionalism and dedication that he has put in so much work to keep himself fitter than ever in order to not only continue playing at this level but consistently exerting such a significant influence in games of such magnitude. “James Milner made big steps in the last three years, that’s the truth. In the 2-1 win against Tottenham, Milner covered 12.9km – more than any other player on the pitch – while also topping the charts for chances created, passes in the opposition half, successful crosses and tackles won. Again, versus PSG Milner won more tackles than any other player, including winning the ball back high up the pitch to create the opportunity which led to Firmino’s winning goal- as he also did in almost the exact same position for Mohamed Salah’s winning goal against Brighton at Anfield. 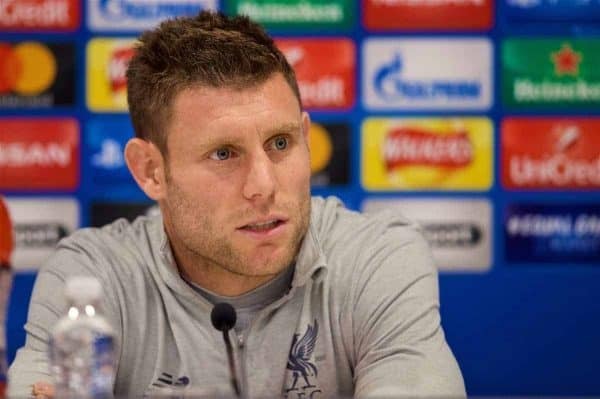 Liverpool face an intense fixture schedule over the coming weeks, and it’s highly unlikely that Milner will be able to start in every single game – but it is very telling of how highly Klopp values him that he started in both games against Tottenham and PSG, back-to-back. There will be plenty of rotation over the coming weeks and months – especially in the midfield positions – but Milner has proved this season why he can be trusted to deliver in the very biggest games when the pressure is on. He also benefits from not being involved in internationals. Milner might not have one single attribute which makes him standout above the rest, but it is extremely rare to find a midfielder whose skillset is so complete as his. It was only two seasons ago that Klopp had converted him into an auxiliary left-back, opting to trust Milner to fulfil that role for the 2016-17 campaign rather than looking to the transfer market to buy a replacement for Alberto Moreno. 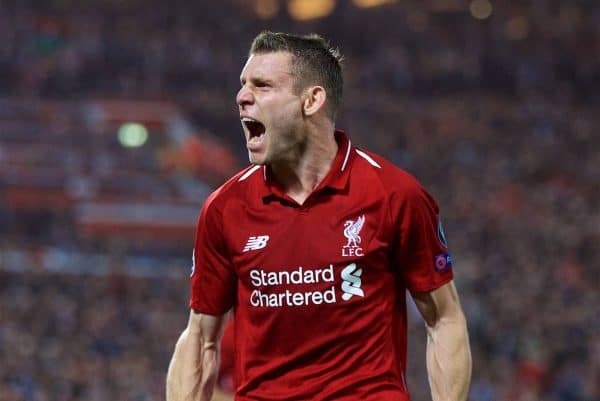 Milner duly adjusted to his new position with aplomb and proved a solid and reliable presence as Liverpool secured a top-four finish that campaign, and was arguably among the best full backs in the league despite having hardly played there for any sustained period of time beforehand. That positional transition was a testament to Milner’s intelligence as a footballer, which is arguably his most valuable asset- even above his tremendous work rate and physicality. His positional understanding and spatial awareness are such that he can play almost anywhere on the pitch and exert a positive influence in games, in a way that so few players are able to do with the same degree of assurance. Last season, when Klopp had to wait another year for the arrival of Keita, he chose not to pursue an alternative in the summer transfer window, but to reinstall Milner as a central midfielder once more – a role in which he had been promised, but previously looked unconvincing under Brendan Rodgers when he first arrived at the club back in 2015. What Milner offers in that role on the right-hand side of the midfield trio is a blend of defensive diligence, efficiency in possession and an engine unlike any other in terms of work rate off the ball. Regularly pulling out wide into orthodox winger positions, Milner constantly makes himself available to receive the ball and in doing so creates more spaces in the midfield of the pitch for others to exploit, while his exceptional crossing provides a dangerous weapon from those wide areas. His lack of natural pace is rarely exposed due to his knowledge of where he needs to be on the pitch, especially when Liverpool are out of possession. 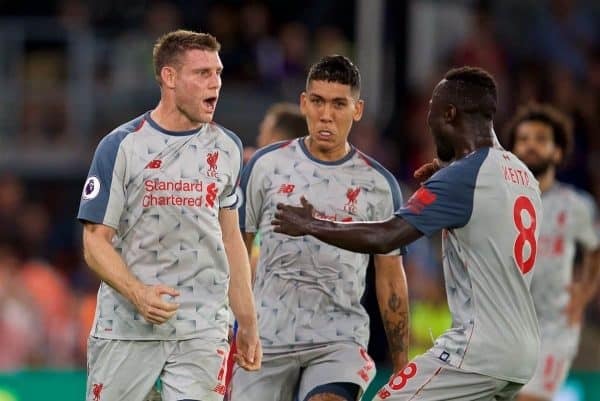 Indeed, a prominent feature of Liverpool’s performances so far this season have been Milner snapping into tackles in and around the halfway line, playing the ball forward and setting Liverpool up for an attack while the opposition are out of shape. And against PSG, Milner made five successful tackles – the most of any player on the night. His work in Liverpool’s own defensive third cannot be overlooked either, as Milner’s awareness to drop into the full-back position when Trent Alexander-Arnold bombs forward ensures that side of the pitch is never left overly exposed to the counter-attack should Liverpool be dispossessed further up the field. That combination of Milner, Trent and Salah down the right-hand side is a core part of Liverpool’s attacking play, and while Salah is yet to find his blistering form of last season just yet, the understanding between those players remains key – even if we generally tend to think of partnerships more often between centre-backs and central midfielders. In a side which features players mostly in their early-to-mid 20s, Milner is the only regular starter over 30 and is thus the most experienced head in a relatively youthful Liverpool team. Ever since Steven Gerrard’s departure and even stretching back to Jamie Carragher’s retirement, a lack of leadership across the team has been a common criticism levelled at Liverpool in recent years. Klopp, however, has now built a side packed with authoritative figures all across the pitch, with the likes of Virgil van Dijk, Jordan Henderson, Milner and arguably Sadio Mane, Firmino and Salah all offering different kinds of leadership. Milner, though, has been playing Premier League football longer than any of them and of course, has the experience of winning it with Manchester City. Having played his way through to the point where now, aged 32, he is a key figure in one of the most exciting sides in Europe, and with a genuine chance at challenging for the league title once more, Milner is the veteran presence in this Liverpool side and brings that know-how and coolness under pressure that comes with so many years of experience at the highest level. Particularly given that Milner largely tends to occupy the right-hand channel of Liverpool’s midfield zone, his influence in terms of Trent’s development should not be ignored. While Trent deserves tremendous credit for his own rapid progress into a first team regular, having the steady presence of Milner close to him on the pitch as a guiding figure can only be an enormous benefit for a teenager making his way in the game. 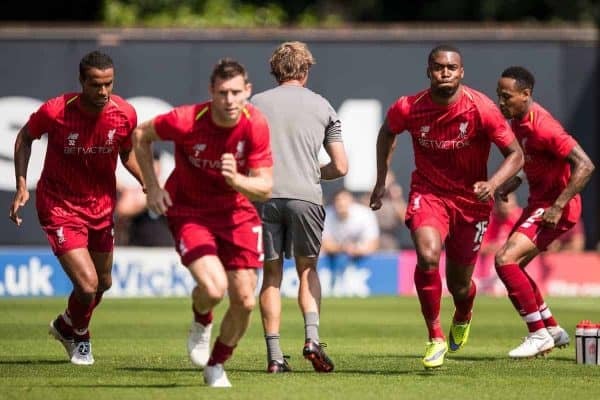 Indeed, for all of his team mates, Milner serves as a model professional to look up to, as he showed when winning the pre-season fartlek test by some distance. This is a Liverpool side filled with players in their mid-20s and those like Trent, Joe Gomez, Andy Robertson and Keita who still have some time before they enter the prime of their careers. Normally, we’ve become accustomed to midfielders hitting their peak around the age of 26-30 and gradually tailing off after that point. For Milner, however, he appears to be finding another gear as he nears his mid-30s – and for Liverpool, that he is proving to be of enormous value.